Musician Dave Navarro is known for his body art, guitar shredding, and iconic rocker look. His intense rocker style includes an array of beauty products that help give him his dark edge, but some makeup was too dark for even him. When Dave discovered that some companies perform cruel experiments on animals in order to test their products, the only choice was to go cruelty-free. Around the world, rats, mice, guinea pigs, rabbits, and other animals are force-fed products or endure the pain of having chemicals applied to their sensitive eyes and skin for product tests––even though the results of animal tests are unreliable and not applicable to humans. These cruel tests are not required by law in the U.S., and they've been banned in the European Union and Israel. Cruelty-free products are manufactured by companies that refuse to poison and kill animals in crude product tests. 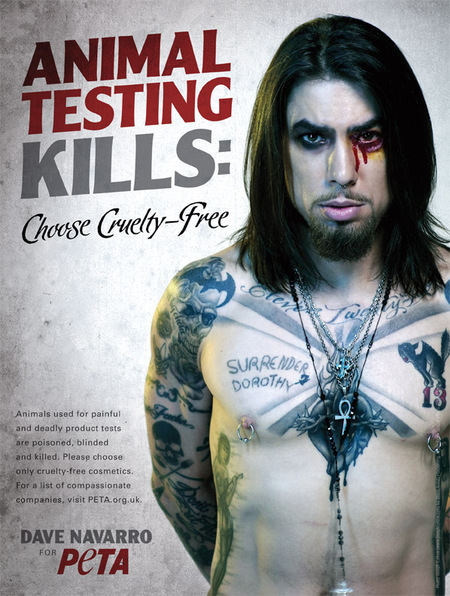 In his ad with PETA, Dave is putting himself in the shoes of the animals who live a painful life and suffer an agonizing death for these archaic experiments. 'I Defy Anyone to Watch This Stuff and Explain Why It's OK.' Dave takes us behind the scenes at his edgy photo shoot with PETA, urging everyone to help stop product testing on animals by choosing to purchase only cruelty-free products. The best way to stop companies from using animals is to refuse to purchase their products and to let them know that you won't buy their products as long as they support tests on animals.